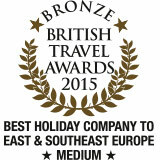 Winner of the bronze award for 'Best Medium Holiday Company to East and South East Europe' at the British Travel Awards 2015. Winner of the 'Best Medium Tour Operator to East and South East Europe' for the third consecutive year at the British Travel Awards 2013. 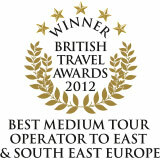 Winner of the 'Best Medium Tour Operator to East and South East Europe' for the second year running, in the British Travel Awards 2012. 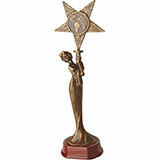 Winner of the Gold 'Best Tour Operator to East and South East Europe' Award at this year's British Travel Awards, which are also known as the Oscars of the Travel Industry. 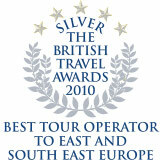 Winner of the Silver 'Best Tour Operator to East and South East Europe' Award at the 2010 British Travel Awards. 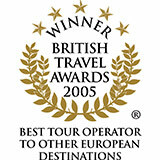 Winner at the British Travel Awards in 2005 for 'Best Tour Operator to Other European Destinations'. 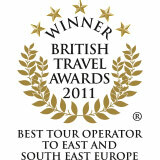 Proud recipients of the BMI Travel Award 2005 for the 'Best Tour Operator to Central and Eastern Europe'. 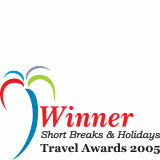 Winner of the 'Best Short Breaks and Holidays' Travel Award in 2005. We have also achieved a place on the prestigious Sunday Times Virgin Atlantic Fast Track 100 league table of Britain's fastest growing private companies for 2004 and in the year 2005 we ranked 35th on the Sunday Times PriceWaterhousCoopers Profit Track 100. Balkan Holidays has seen an incredible growth in sales of beach and skiing package holidays to Bulgaria over the last few years. We would like to thank all our clients and travel agents for helping us achieve our successful entry to the Fast Track 100! 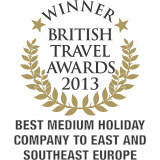 These awards are a brilliant way to celebrate our many years of organising great value holidays to Eastern Europe.